Come join queer owned businesses as we provide an alternate space for our community to gather. 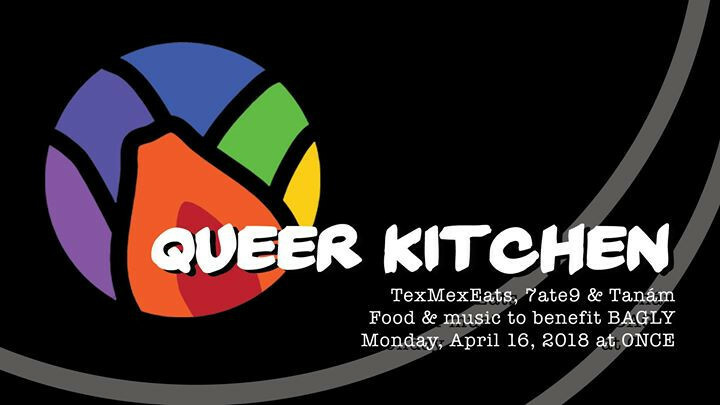 We'll have food by queer chefs and music by queer creators. All proceeds from this event will benefit LGBTQ your organization, BAGLY. BAGLY is a youth-led, adult-supported social support organization committed to social justice, and creating, sustaining and advocating for programs, policies and services for the LGBTQ youth community. $20 Ally Ticket -- One $5 dish from Tex Mex Eats, 7ate9 and TanÃ¡m. $60 Supporter Ticket -- One $5 dish from Tex Mex Eats, 7ate9 and TanÃ¡m & take home bag of products from each business (four pack of tamales, lumpia and mini-cheesecakes to go [total $52 value]). 33% of this ticket will benefit BAGLY. Food from 6:00-9:00 PM, music until 10 PM. A la carte items available. Cash bar. Kabocha and eggplant skewer with coconut milk sauce and a vegan shrimp paste grilled onigiri (vegan, gluten-free) 5. Rice bowl with spicy kaldereta (beef cooked in rich tomato sauce with carrots, potatoes, peppers and green onions) (gluten-free) 9. Assorted flavors like classic, Valrhona chocolate, Valrhona and espresso mocha.